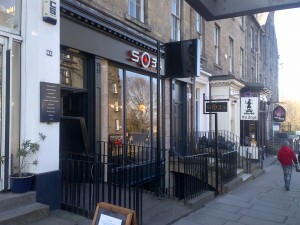 Bar Soba arrived in Edinburgh in December, taking over the premises previously occupied by Seadogs/Amore Dogs/Underdogs. I’d been meaning to visit, and this thought became a reality, following two things. Firstly, I was passing the other day, and I saw that Chris, who used to work in Domenico’s, was working there. We had a wee chat, and I promised to visit, soon. Then secondly, regular quester Ross, who previously joined at The Dogs, suggested it as a lunch venue for our latest catch-up. While the fabric and structure of the interior remains as before, the place has a completely different vibe to it. 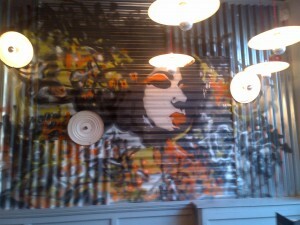 I really liked the new modern and urban décor. Seating is a blend of tables and booths, along with long bench tables, towards the front. We were seated in the window, at a good people-watching spot. We contemplated their menu, which offered two courses for £9.95. This looked a decent deal, considering the full price of the individual dishes. The service wasn’t all that it could have been. As our lunch progressed, the room did get a bit busier, but the three staff members who were working could have handled things more swiftly and efficiently. Soon enough, though, we were brought our starters. 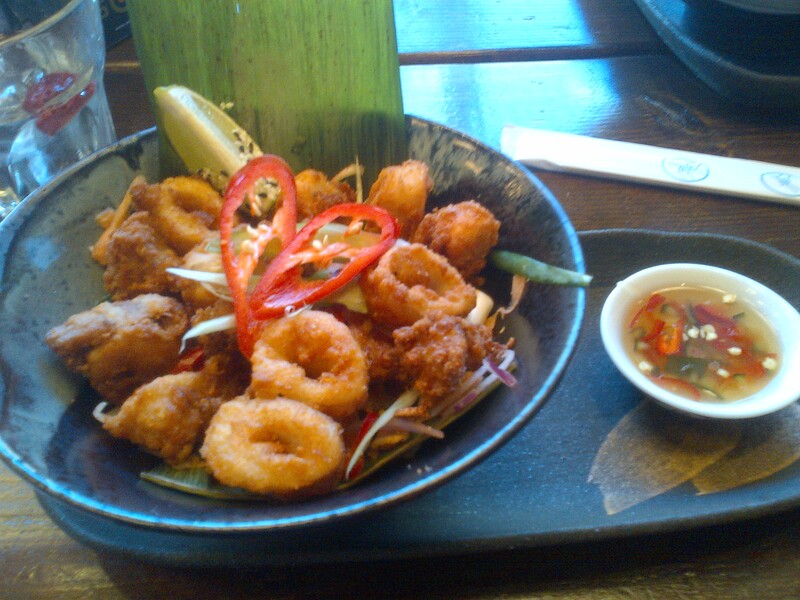 We’d both opted for the salt and pepper squid. It looked a good sized portion, although the darkly crisp squid morsels hinted at the need for a change of oil and/or that they might be a little overcooked. For me, they were cooked fine, but the batter was too vigorously seasoned. The light flavour of the squid was drowned out by the salt, with each crisp bite offering a generic salty savouriness, but nothing much beyond. The accompanying salad was a pretty poor effort, and the dipping sauce entirely characterless. For mains, I opted for the pulled pork ramen noodle soup, while Ross opted for a fusion dish of hoisin pork roti, with chilli mayonnaise, Thai vegetable slaw, and paprika covered chips. Would you care to count the different cuisines rammed into that fusion pile? Me neither. My dish was the outstanding item we were served. The pork was very tender, the broth had good flavour, there were good chunky vegetables, and a nice variety of textures. Another tie was ruined by my inaccurate chopstick work, but that’s just an occupational hazard I’ve come to embrace. 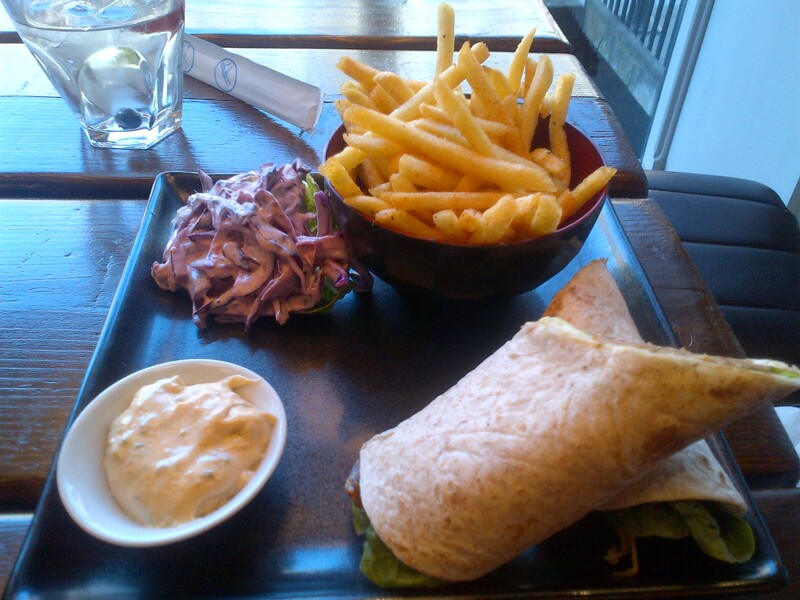 It’s a dish I enjoyed, and would happily order again. So overall, I think that some of Bar Soba’s attempts at fusion food are just a bit over-the-top. Certainly Ross’s main course was off into the realms of the bizarre, trying to span Thai, Chinese, Indian and Spanish cuisines and who knows what else. Seeking to showcase new and interesting flavour combinations is generally to be commended, but this just felt like it was trying too hard. 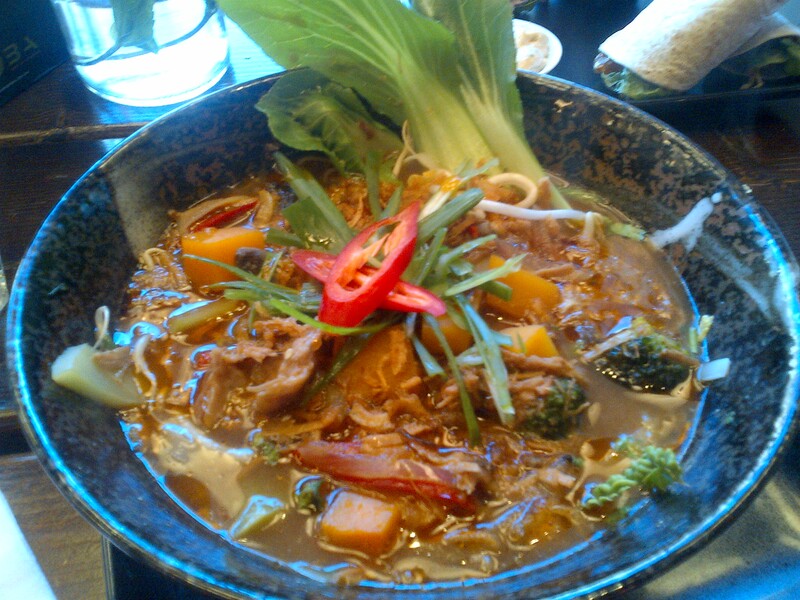 Where they kept things relatively simple, as with my pork ramen dish, things were on a much surer footing. But overall, I think this is somewhere that will capture people’s imagination as a place for a drink, rather than as a dining spot.